In 2010 Ralph Barclay met with his pastor at Our Savior Lutheran Church in the American farming community of Wayne, Nebraska. His words were something like this: “Pastor, I have long been a member here but mostly I have been taking. Now is time for me to give back. I don’t have big resources myself, but with your approval I would like to invest my time in talking with other members to see if we could gather funds to build one of two of these house in Tanzania.” Pastor Bob Oleson said great, and Ralph went to work. By May of 2011 the members of Our Saviors had given enough to build not one or two but 7 Houses for health. But they were not done. In 2012 they added two more and in early 2013 the 10th our savior house is being built. 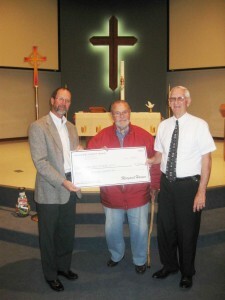 Thank you Our Saviors Lutheran Church and thank you Ralph Barclay!! Previous StoryKitu Cha Ajabu / An Amazing Thing – House # 50 Completed!! Next StoryNdosi Family has Visitors!